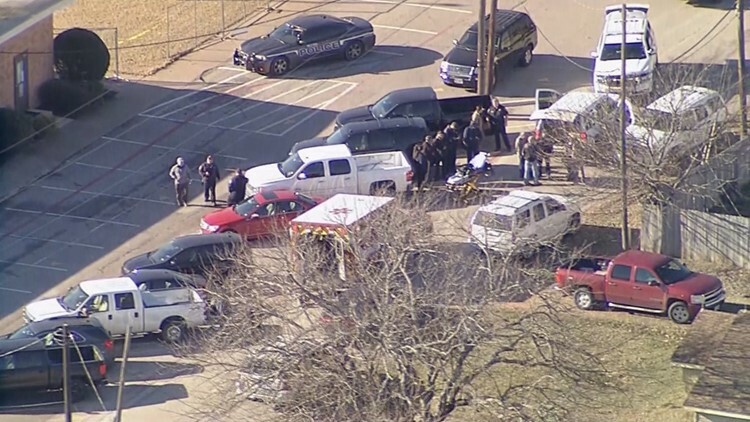 The Ellis County Sheriff's Office has a 16-year-old suspect in custody after a school shooting Monday morning that left a 15-year-old shot. 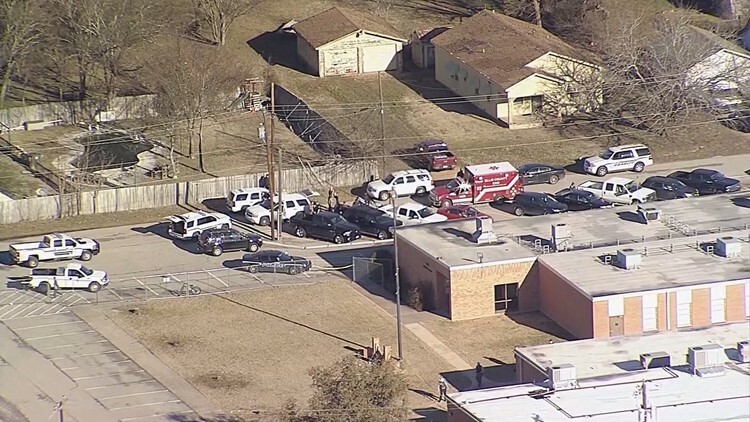 ELLIS COUNTY -- The Ellis County Sheriff's Office has a 16-year-old student in custody after a school shooting Monday morning that left a 15-year-old injured. Just before 8 a.m., an active shooter was reported at Italy High School in Italy, Texas. A 16-year-old male student was taken into custody without incident after shooting a 15-year-old female student in the cafeteria with a semi-automatic handgun, Sheriff Charles Edge said. Staff members confronted the suspect, who then fled before being arrested outside the school. The girl was taken via helicopter to Parkland Memorial Hospital in Dallas. Her condition hasn't been released. "This morning's tragedy hits the heart of this community," Superintendent Lee Joffre said. "Our staff acted as trained and addressed the situation the best way they could." He added that counselors will be provided on campus to speak with students. Other students told WFAA about events that apparently happened in months and years past involving the 16-year-old student. "They shouldn't have let him come to the school anymore after some of the stuff he's done," said Alyssa Crawford who claims to be a former friend and former student at Italy High School. Students told WFAA that the boy was apparently disciplined because of those events. The school district would not confirm any such incidents occurred. "Unfortunately a school district is not allowed to release any disciplinary information about a student," said Superintendent Lee Joffre. Earlier in the morning, an Italy ISD parent showed WFAA a text message alert Superintendent Joffre sent Monday morning. The message confirmed the shooting at Italy High School, and stated that one person was shot and taken to the hospital. 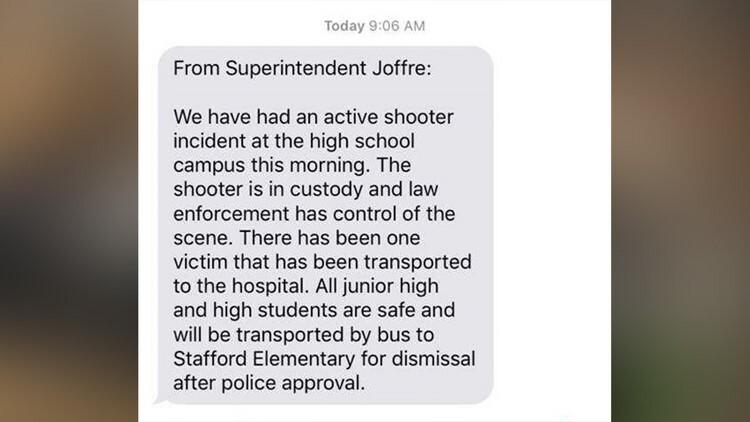 Officials at Stafford Elementary School confirmed to WFAA that it and the high school were both under lockdown during the investigation. High school students were taken to Stafford Elementary School before being reunited with their parents. School will be in session on Tuesday as normal, the superintendent said. According to the Texas Tribune, Italy High School has students in 6th through 12th grades. Last school year there were 281 students enrolled. Italy, which calls itself "The Biggest Little Town in Texas," is located off Interstate 35E, near U.S. Highway 77 and State Highway 34, about 15 miles south of Waxahachie.